Results from KRA Speedway in Willmar are in. Jonathan finished in 6th in his heat and 13th in his feature. The races are cancelled at KRA Speedway for tonight. Military night will now be on May 31st to honor all those who serve our country. Check out KRA Speedway for details. 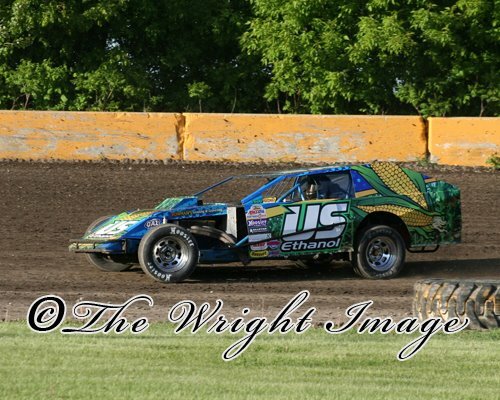 Jonathan raced in Willmar at KRA Speedway on Thursday, May 17th. He finished 4th in his heat. In the feature he was running 8th when he had a flat tire and collided with another car. His pit crew changed his tire and got him back on the track. He restarted in the back and with 3 laps left had another problem which resulted in a DNF. Next Thursday, KRA Speedway is honoring Memorial Day. Here are the latest photos of Jonathan’s car. This is the first night out on the track in Willmar at KRA Speedway. Thank you to Sherry Wright and The Wright Image for the photos. You can see more of her work at KRA Speedway by clicking here. 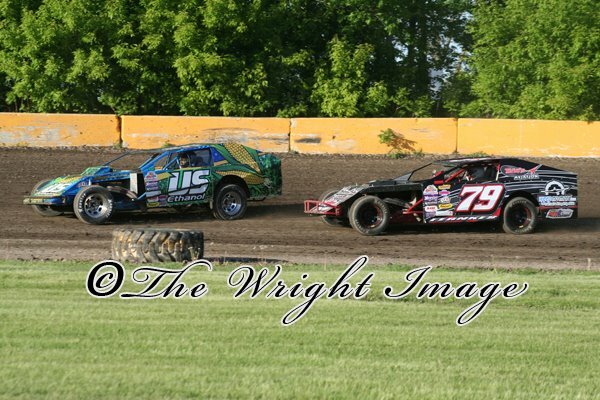 Jonathan raced Sunday, May 13th in Sauk Rapids at the Granite City Speedway opener. He finished 3rd in his heat and 14th in his feature. You can see more results here. The first night of racing is complete! Jonathan raced in Willmar for the season opener. In the heat, he took 6th. In the B-feature, he also took 6th. He took 15th in the feature. It was a good night to get the feel for the new car and see how things are running. Look forward to Sunday! Doug didn’t race and had fun helping Jonathan with his car. 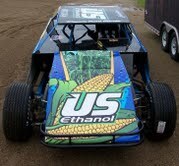 New photo’s of Jonathan’s 2012 car are in. Looking good to start the year off! See you Thursday in Willmar! The season opener for KRA Speedway in Willmar has been cancelled due to the track being too wet. We look forward to next week. 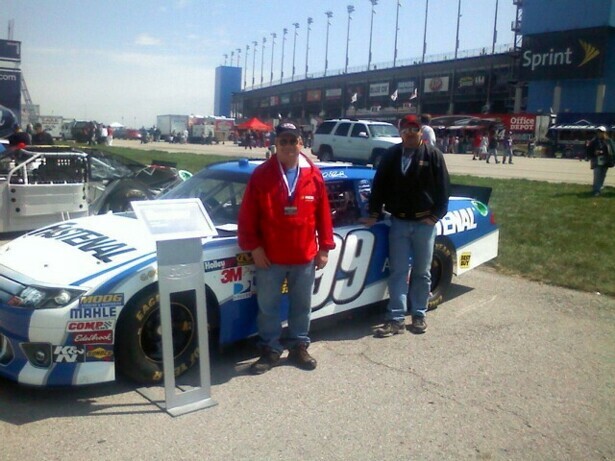 John and Doug Olmscheid took time out to get into the racing spirit with a trip to Kansas to watch NASCAR. Here they are by NASCAR Driver Carl Edwards‘ #99 Ford Fastenal. 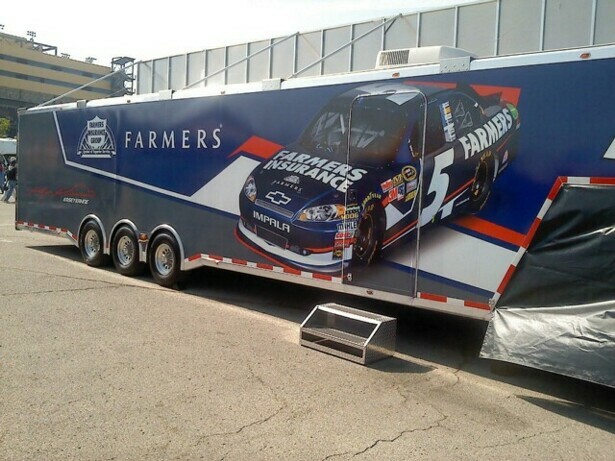 Here is Kasey Kahne‘s Hauler. 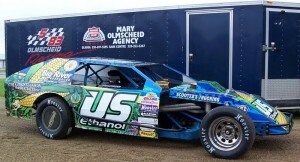 Farmers Insurance is also one of Doug and Jonathan’s sponsors with Mary Olmscheid Agency. Doug’s car is a 1980 Malibu that he raced on asphalt. He plans to convert it to a dirt track car. He says it needs a change in the suspension and some frame work to be converted to the dirt track rules. These are only a few things but they will take time. He really just wants to get the car out on the track to have some fun! !